New Delhi: Passenger car sales in India registered a robust growth in October as car makers launched new models and offered discounts to lure buyers. Two-wheeler sales, however, clocked a decline, according to figures released by manufacturers. Swift ride: A file picture of Maruti Udyog Ltd’s cars ready to be shipped out to dealerships at the company's Gurgaon factory. Maruti reported a 15% gain in sales on demand for the SX4 sedan and the diesel Swift. Maruti Suzuki India Ltd, maker of half the cars sold in the country, reported a 15% gain in sales on demand for the SX4 sedan and the diesel-powered Swift hatchback. The company sold 69,415 cars, vans and sports utility vehicles in October in India and overseas, compared with 60,163 a year earlier, the auto maker said in an emailed statement on Thursday. General Motors India, a unit of General Motors Corp., posted the strongest sales growth among car makers. The company registered a record growth of 95% in sales in October compared with the corresponding period last year. It sold 6,139 units last month, against 3,153 units in the year-ago period, making it the highest-ever monthly sales figure achieved by GM India since its inception. Honda Siel Cars India Ltd, however, was an exception. The company, a joint venture between Honda Motor Co. Ltd of Japan and Siddharth Shriram Group company Siel Ltd, reported a 5.06% dip in vehicle sales during October at 5,287 units compared with 5,571 units in the year-ago period. Commercial vehicle maker Tata Motors Ltd reported sales growth of 13% for the month. The company sold 49,354 units, up from 43,743 units in the same month a year earlier. 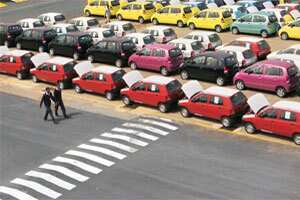 Tata Motors, India’s third biggest car maker, said sales of cars and utility vehicles rose 8% to 18,021 units. India’s biggest maker of sport utility vehicles, Mahindra & Mahindra Ltd, reported a 46% gain in domestic auto sales in October on higher demand for the Scorpio SUV and the Logan sedan. Mahindra sold 23,578 cars, SUVs, trucks and three-wheeled auto rickshaws last month, compared with 16,173 a year earlier, the company said in a statement posted on its website. Two-wheeler makers, however, reported a decline in sales as potential customers deferred plans to buy vehicles in the wake of higher interest rates. Bajaj Auto Ltd, India’s second biggest motorcycle maker, said vehicle sales in October slipped 1% from a year earlier. It said sales fell to 278,176 units from October last year, with sales of motorcycles also falling 1% to 248,307 units. TVS Motor Co., the country’s third largest two-wheeler maker, reported a 26.61% dip in motorcycle sales during October. Bike sales fell to 67,752 units in the month against 92,328 units in the corresponding month last year. The company’s total two-wheeler sales during the month also slipped 9% to 129,614 units against 142,325 units in October last year, TVS said in a statement. But India’s biggest motorcycle maker, Hero Honda Motors Ltd, bucked the trend registering a less than 1 percentage point growth in two-wheeler sales in October. The firm said it sold 365,022 motorcycles and scooters in India and overseas last month compared with 363,480 a year earlier. Reuters and PTI contributed to this story.